For whatever reason, closed-end funds don’t have nearly the following – or analyst paperazzi – that dividend-paying stocks boast. This “secret” is one of the last great efficiencies in an otherwise tough-to-beat market. Are managed for free (I’ll explain more later) by a top-notch investment manager. Let’s start with an example featuring stock-based CEFs. For those of you shaking your head at your portfolio’s low yield, you can actually 2X or 3X your portfolio’s yield and improve your upside potential to boot using this strategy. And it’s actually simpler than traditional stock picking. 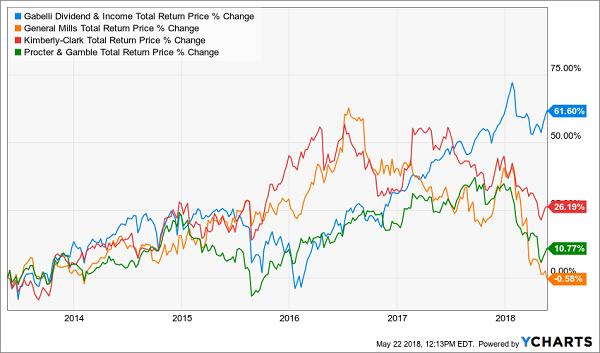 Many income investors have mistakenly parked their capital in “safe” consumer staples like General Mills (GIS), Kimberly-Clark (KMB) and Procter & Gamble (PG) in search of yield and security. Their money was safe, alright – their cash has grinded straight sideways for the last five years! They’d have been better off “outsourcing” their dividend decisions to the great Mario Gabelli. His namesake Gabelli Dividend & Income Trust Fund’s (GDV) tends to pay around 6% or so (it yields 5.8% today). Mario’s dividends show up around the 14th of the month, every month, to the tune of $0.11 per share. Sounds like a sweet deal, right? His investors get the benefit of a legendary money mind along with his access to ideas and cheap money. And get paid monthly to boot. His secret sauce is his stock selection. Meanwhile our opportunity lies with the discount – the fact that Mario’s fund tends to trade at a discount to the value of the shares it holds. Over the past three years, GDV has traded at an average discount of 10% to its NAV (net asset value) – which means investors have bought his stocks for just $0.90 on the dollar. Mario’s brilliance at a bargain is one example of our “CEF edge.” With $1.9 billion in assets, this particular fund is too small for big players to put money to work. Which works out perfectly for us. And in CEF-land, stocks aren’t the only assets with price upside. Let’s now talk about way to further accelerate these returns. As nice as Mario’s 60% in five years is, I’m going to show you how to bank that much in just two! There are serious deals available in secure bonds. No safe bond pays 8% itself, of course. But it is possible to generate 8% and even 9% or more from a portfolio of reliable bonds. You can even diversify your portfolio, bank these safe 8%+ and hire one of the best bond managers on the planet. For free, to boot! It just requires a bit of contrarian thinking – and knowing which publicly traded funds these guys are managing behind the scenes (via their often-underrated CEFs). Here’s a real-life fixed income bargain. You probably know the “Bond King” Bill Gross. How about his successor, Dan Ivascyn? When Gross left PIMCO, a tide of cash followed him out the door. But the flow of money quickly subsided when Ivascyn stepped to the plate and outperformed Gross himself. No wonder PIMCO let the King walk out the door – they had their next superstar in waiting! But from time to time you can hire him for free. In fact there are times you’ll be paid up front to give him your money! 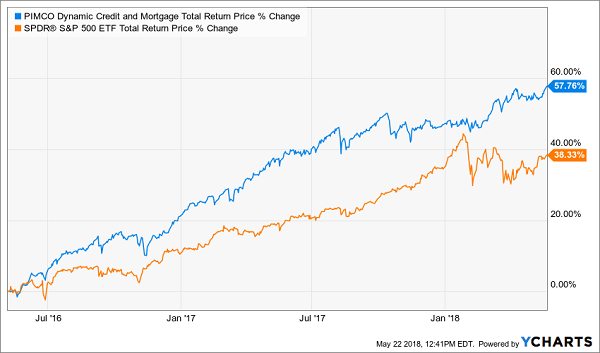 And like buying a regular stock or mutual fund, you can buy this super CEF with one-click from your computer (or tap from your phone) by purchasing PIMCO’s Dynamic Credit and Mortgage Total Return Fund (PCI). PCI charges a 2% management fee. But it’s easy to get the fee comped – if you simply buy the fund when it trades for a discount. But I always demand a discount. A 2% discount means our management fee is comped. A bigger bargain means we have some upside (as the discount window closes) and our yield is higher than it would be if the fund traded for fair value (because income is earned per NAV unit – so the less we pay for it, the better). The three funds above are trading at big premiums however. Is it possible to ever get Ivascyn’s expertise at a discount? You bet. PCI had been neglected by investors because of its strategy focused on mortgage-backed securities (MBSs), which had the lead role in the last financial crisis. They have recently been immortalized in the book and movie The Big Short. MBSs blew up the financial system in 2008 and have been outcasts ever since. But a “second-level” look at mortgage payments showed these assets have successfully completed financial rehab. They quietly began to enjoy the benefits of clean living – with mortgage defaults and delinquencies trending down. Ivascyn and his team capitalized on this misplaced despair. Ivascyn Worth Every Penny: +58% Net of Fees! Our secret here was our “no brainer” purchase of a 10%+ yield at a 10% discount. Ivascyn did the rest – not only did he keep his monthly distribution funded, but he bought bonds that went up in value as rates rose. Even after we pocketed these generous monthly payouts, the fund’s NAV sits 18% higher today than it was two years ago. Proving that it is possible to bank plenty of upside from secure bonds. You just need to know where to look – and CEFs are the ideal place to start. Looking for some great CEF buys today? I’ve put everything you need to know in an exclusive report, Monthly Dividend Superstars: 8% Yields with 10% Upside. And I want to send it to you today for FREE. In this private briefing, I’ll introduce you to three incredible income plays most people don’t even know about. And a steady Eddie high-yielder that barely blinks when stocks plummet. Click here to get a full copy of my CEF research right now. Your free report includes the names, tickers and projected returns for these three monthly paying CEF bargains.